It's difficult to know what to expect out of such a massive crossover like Project X Zone 2. When one game includes characters, places and references to dozens of franchises from across five different companies, one must wonder whether there will be balance to all of the different parts at play. 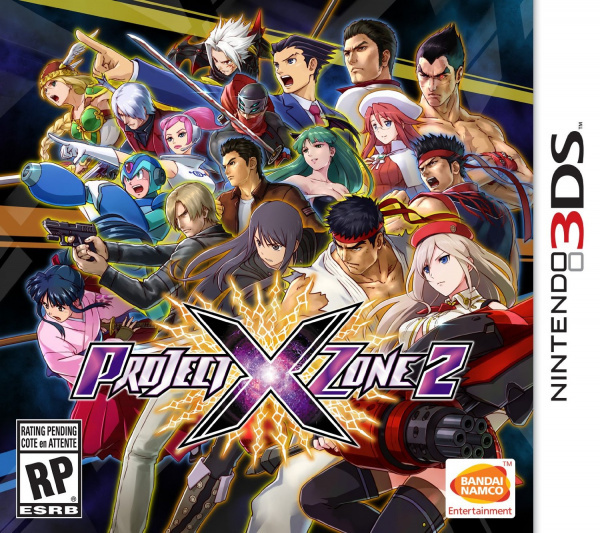 Fortunately, Project X Zone 2 pulls it off beautifully; while the story may ultimately not be anything to write home about, the gameplay and presentation alone make this an accessible RPG experience that anybody should be able to enjoy. 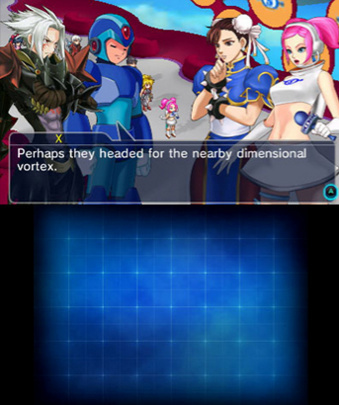 The story of Project X Zone 2 doesn't require knowledge of the events of the first game, though veterans will certainly appreciate subtle references to them. The premise mostly follows how Shinra – a secret government organization that deals with paranormal threats – deals with a series of giant golden chains that have begun to appear across space and time. Naturally, this is used as a vehicle to introduce characters from multiple different franchises, and for the most part it works. The plot never takes itself too seriously, and this works very much in the game's favour. Characters are frequently wisecracking and addressing the absurdity of whatever situation they find themselves in, and it helps keep things lighthearted and silly, in a sense. That being said, the plot can be fairly difficult to follow, and it feels shallow as a result. When literally dozens of characters all chime in during one conversation, dialogue can be confusing and it becomes tiresome to read through walls of text. Due to the ensemble cast, not everyone gets a lot of screen time either. This causes something of a domino effect; poor characterization makes it difficult to care about the characters, which makes it difficult to care about the plot in general. Granted, one likely isn't playing a game like this for its engaging and coherent plot, but it would be nice if the storytelling was better executed. Of course, the meat of this game is found in the strategic gameplay, and it's here that things can get pretty addictive. Instead of the confusing number system of the first game where characters and enemies went in a varying order, there are now player turns and enemy turns. This helps streamline the experience and makes it much easier to plan out strategies. Characters move about on a grid, and placement is now of utmost importance. Attacking an enemy from the side or back allows one to do more damage, but enemies can do this to players, too. Also, standing next to an ally gives you the option to have them jump in to the battle and give you a hand in doling out some punishment. Battles are live action and demand split-second timed button presses. Typically, each character gets to use three moves during a battle, with the goal being to chain them together in a way that allows them to juggle the enemy character. Attacking the enemy just before they hit the ground initiates a critical that both does more damage to them and gives the player more experience points at the end of the fight. Naturally, there are much more technical elements available for more skilled players. Attacks can now be charged between fights; choosing not to use a certain attack during a fight means that it will have increased effectiveness when used in the next fight. The Mirage Cancel is another new addition, where the player can cancel a move as they're using it, get back one bar of the attack gauge, and slow down the enemy in the process. Cross Hits have made a return from the first game, too, where timing a support or solo unit's attacks with yours will freeze the enemy in place in fill up the XP gauge much faster. Separately, all these techniques may not change up the game too much, but together they make for a battle experience that requires finesse and attention in order to dish out the most damage per turn. The beauty of it is that this makes for a battle system that will satisfy both newcomers and veterans. It's certainly doable to beat waves of enemies by just spamming attacks and taking a more basic approach to things, but there's depth here that puts a much higher skill ceiling on the whole affair. In general, fights aren't as difficult as they were in the first game, but they're still challenging enough that they don't feel easy. There's also more in-depth character customization options, which allows one to build teams that cater to their own playstyle. 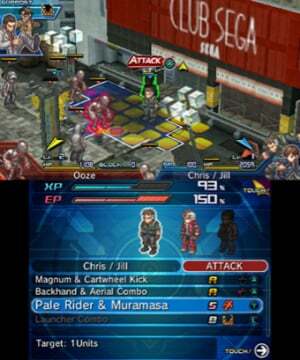 In between stages, there's an 'Intermission' where players can go to a shop to buy items and gear for units. Additionally, there is now 'CP' earned by each character which can be spent to level up specific attacks or purchase new skills to be used in battle. This gives you plenty of control over how you want each character to grow, and the limited resources means that you need to plan out how you want the party to be oriented. 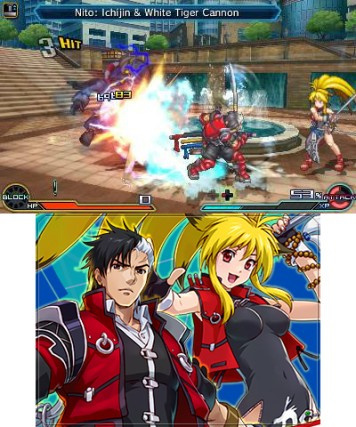 Naturally, one can't talk about a Project X Zone game without mentioning the presentation, and Project X Zone 2 absolutely delivers on this front. Characters and enemies are all drawn in high-quality, colourful sprites, and watching them in action is a sight to behold, especially when there are five characters attacking an enemy at once. The animation is handled in a fluid, bombastic manner, and it never gets tiring seeing characters using the same attacks over and over. Regardless of how much action is on the screen, the framerate never once slows down, and the 3D effect lends a nice sense of depth to some of the attacks. Overall, the visuals are possibly the best part of the experience and almost make it worth the price of admission alone. The music is also very well done, though one's enjoyment will depend on how familiar the player is with the various franchises being represented. Remixes of songs related to each character or series are present throughout the whole affair, and help to give the soundtrack both depth and diversity. While they do tend to blend together after playing the game for long enough, one would be hard pressed to say that this is a boring soundtrack. Might buy this just for Phoenix Wright lol. Do he and Maya get some shining moments in this? @Discipledoctor I was gonna say the same thing I was gutted when he didn't get in the first game! Did they leave in Segata Sanshiro's theme music from the Japanese version? No music rights edits or any crap like that being pulled right? Gonna get this at some point. The first PXZ was pretty fun just as a means of killing time with simple gameplay much like a Musou/Warriors game. I didn't mind it so much that I even played through it about 3 or 4 times in NG+, so I'm sure I'll make use of this one in similar fashion. I'll wait on this, though. I'm getting Fates which will be a fellow SRPG occupying my 3DS so until I'm done with that I'd rather keep my money. Loved the first one, despite the insane length of the later battles (I was playing them over 2 separate nights towards the end). Had a blast and I'm really looking forward to trying the new battle elements listed above. Great review. Can't wait. I loved the 1st one, up until two levels before the end. Where things got a little too tedious, but not so tedious that I wouldn't do it again. PxZ2, here I come! i still have not got the first one yet, i would like to so i'm not missing anything important in the story line. Hopefully there's a demo released for this game. @abbyhitter There's a demo on the eSHOP right now! The only sad part is that we're just 6 days away from Fire Emblem Fates release, and I'm getting the special edition, so I'm little short on money. And with 3 fire emblems to play I won't be able to play anything in a long time. I rather enjoyed the first Project X Zone, however I might put this one off until the summer. More money and a smaller backlog being the two reasons, still glad to here this one has plenty of improvements to the first game! Man, I really hope New Game + will step up its difficulty, because this is gonna be a breeze. So better than the first. @DoctorOverbuild you and a good 99% of people didn't finish the first game, it was just far too long! Too bad I'm not into SRPG. Would love a fighting game with those three companies tbh. Looks very good, but the thought of lower difficulty is a bit disappointing. The first one was already fairly easy! I want this but the problem is FE Fates is releasing really soon and I can't justify buying another full price game on top of that especially when they are in similar genres. Apparently the Japanese limited edition has a better soundtrack. Does the international version includes the normal or the better soundtrack? "it never gets tiring seeing characters using the same attacks over and over. "That's all i needed to not buy this game. It lacks Klonoa, Gantz and Krino Sandra. I don't care if the game's supposed to show only human characters as allies, I believe that Klonoa, Gantz and Krino would have a return. Like, they're the characters that's also in Namco X Capcom, a game that started Project X Zone! Which one is the fifth company? I'm getting this as soon as I can afford it. I really enjoyed the first one despite it dragging on a bit towards the end. I just love the mashups of all these awesome characters in one game. Can't wait! Can chapters be freely replayed? I have yet to finish the first one so if even just one of the two titles features a "choose a chapter" mode I would be happy - I'd hate to be stuck with a New Game Plus and nothing else. "It never gets tiring seeing characters using the same attacks over and over." And there goes my trigger to not touch this game ever. I still haven't beat the first one. Probably won't get this, atleast for awhile. I wish there was something like this out on Wii U. Loved the first game, so I got this one even before reading this review. Seems I choose wisely. Will beat both FE games first but this is next on the play docket. @Ryu_Niiyama Same as, I need to start with FE: Awakening First. 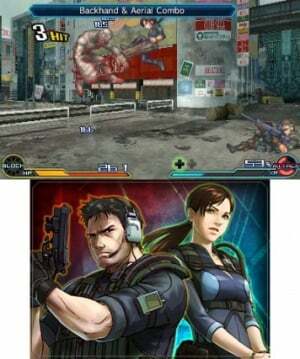 I really wish Konami and Square Enix characters were in this one. Maybe if there is another sequel. Could anyone confirm the european release features the original japanese voices and BGM? I suppose the opening lost the song, thznks to the potential rights problem (like the first one). I was hoping this review would enlighten me about the content of the various item packs and more importantly the special mode available for purchase. Did anyone try smthng ? PS: is there a little "poster" included like with the first game? I think this review is not really to be trusted as everything i have read sounds like a person who is hyped by the nostalgia rather than a neutral or noob to the type of gameplay . The first one was fun for about an hour then pressing the same button to watch the same action sequences over and over again got pretty boring quick and the story sucked so if the story is practically the same old bull and gameplay similar then i wouldn't really recommend this game to anybody other than fanboy nostalgia collectors . Any game with nothing memorable other than flashy effects and moves isn't really worth a purchase to me . First off, I really enjoy the new layout to reviews, partially the score being on the top with the publisher and ect. Bravo NintendoLife. Now about the review, the game seems pretty solid. Not so sure about the battle system. I'm happy someone stated there's a demo above, I'll defiantly check that out tomorrow! I'll get round to this eventually. The demo was Fun and it was interesting being introduced to new franchises, makes me want to check out those games. @wazlon oh i loved awakening. Radiant dawn is still my fave but I beat awakening. Waiting on pins and needles for fates and #fe to show up in the mail. I only recognized about a handful of characters from the first game (having not even played a lot of the games they're from), and I highly enjoyed it. Glad to know I'm in the 1%. Same here. I really wanted to get the pre-order bonuses for this game, too. The HOME menu theme looks really cool. But alas, I can only buy so much... But hey, at least we're getting what's basically three new Fire Emblem games, and a cool carying pouch! @Phil_Kavadias I feel like this game is very much an 'acquired taste'. I'll admit, I'm only familiar with about 6 or 7 characters here, and I initially didn't really like this game. However, after putting enough time into it, you begin to see the depth that combat can have and it makes the whole thing a lot more interesting. @GoldenGamer88 That's what I personally initially though PxZ would've been back when they kept teasing stuff about it. 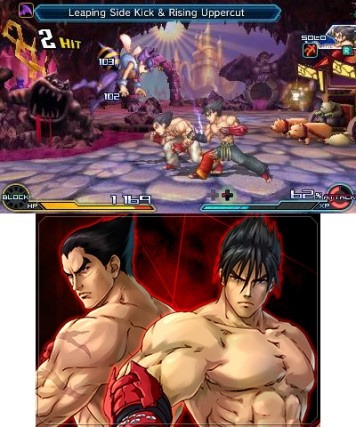 Too bad it's just a continuation of a series though, Namco X Capcom was the game to start it and now PxZ changed names and added Sega into the mix. @MitchVogel Same! There's only a few series I recognize out of the whole bunch, and even if I kno w them but haven't directly played their games it never really detracted from my enjoyment of the game. I don't think knowing the characters is that important here, maybe playing through will interest you in some of the more obscure series they have like what happened with me. @davidevoid Yup I never got round to it I'll be getting it along with this! @Discipledoctor Kinda early to tell (I am in Chapter 4), but he and Maya bring some funny dialogue. Well the opening is the song (with lyrics), hence, just like the original version. I enjoyed the demo more than the demo for the first game. Also I hear that you can get X and Zero fairly early into the game so I'm sold. already got my copy preordered. also got some DLC and a free theme with my preorder. can't wait to play this game. @Ryu_Niiyama You've reminded me I haven't played Radiant Dawn yet!!! Have owned it for ages too, if it's anything like Path of Radiance then it's going to be awesome. Will be getting this soon if I ever completed the first one first. Not for this old man. The first game left a bad taste. I might pick up on sale later on down the road but its not a must have for me. The first wasnt all that good too me so I wont be buying a bit of the same. I know aome major work goes into doing these crossovers but I would rather play Hyrule Warriors on 3ds. @MitchVogel could you pitch in here? I need a little help. What DLC is in the game and what are its prices? I can't find it anywhere online and the eShop has nothing on it :/. @sWiTcHeRoO I was under the impession that there isn't any DLC yet. Is that not the case? @MitchVogel There's a section between intermissions where you can get DLC apparently. I saw something like that when playing the demo the other day. Also, if you pre-order the game (at least from what I saw on Amazon) you get the DLC for free which is like some extra mission, bonus items, and a 3DS theme. I'm mostly interested on that mission. @sWiTcHeRoO There's several 99 cent item packs and the SP Advanced Mode is 3 bucks. I'm not sure about that Amazon DLC, it might be exclusive. I really didn't enjoy the first one, so I will pass on this one. @Rei Yep the voice overs are in japanese.